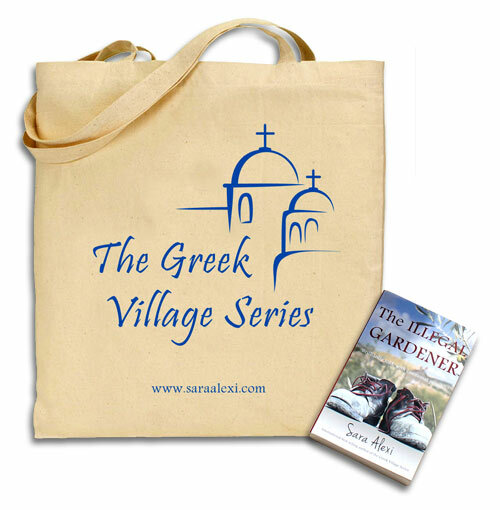 All profits from the sale of these Greek Village Series Tote Bags will go to Greek charities that are helping the people of Greece. But I’m even more thrilled to offer all profits to Greek charities to help the people of Greece who find themselves struggling at this time. The bag plus postage to the US is $12.85. Please use my PayPal account: saraalexi@me.com, and I’ll send one along on receipt. I’ve checked postage costs this morning, and the total to the US is $12.85. Please use my PayPal account: saraalexi@me.com, and I’ll send out your bag on receipt! Everything has gone smoothly and there is one on it’s way to you. Sara. I’d like one bag please not sure if previous request worked! The price including postage is £6.20 in the UK, and you can use my PayPal account: saraalexi@me.com. I want one where do I send $j? I’ll package one up for you right now! I want (NEED) a tote. How do u want me to pay? Do you have a Paypal account? Or what is your preference? I take my gat gadgets to work everyday. I’m tired of having to buy bigger purses just to squeeze them in. This would be perfect and I could go back to a reasonably size purse that I don’t need to switch every time I go out. Plus, I’m sure it will initiate conversations at work that I can help pursued new readers for you. Please let me know how you want me to pay for my tote. I can’t wait to get it. PayPal is great (saraalexi@me.com). The total including postage to the US is $12.85… Postage to the US is expensive!! I would like a bag please, Sara. 24 Crest Way, Portslade, Brighton BN41 2EY UK. Do you have paypal account? The cost including P&P in the UK is £6.20, and you can make a payment to my PayPal account (saraalexi@me.com). I’ll post the bag on receipt. I would absolutely love one . How do I apply for one ? If you can email me your address details to saraalexi@me.com, I’ll reply with postage costs and PayPal acc. details. I’ve added postage costs to the UK, US and Europe above. If you send payment to my PayPal account (saraalexi@me.com), I’ll post out your bag on receipt. If you are not in the UK, US or Europe, please email me and I’ll reply with the postage costs. Hi Sara. I would like one of the bags please, but can it wait till we get home from Zante on July 6th to the UK. Hi Sara. Have just sent the payment via PayPal. Sorry for delay. Life has been a bit hectic as usual since we arrived home from Zante. I’d love one, please, Sara! I’m a recent newcomer to The Greek Village Series and I’m loving them. This bag would be perfect to carry the books in, on my upcoming visit to Lefkada! Yes I would like one of these please. Great Pam, Please follow the instructions and transfer the appropriate payment according to where you are to the email address provided through paypal and one can be on it’s way to you. Hi Sara, I will be ordering 3 bags to the UK, 2 on behalf of my friend Wozzie Rose Mercer from Australia who will be coming to the UK later this year to collect her bags in person! Can I please just check, is the postage price to the UK per bag? No problem either way, just want to check before I pay? Hi Sara. I ordered a bag on PayPal on Friday I think. Hope it went through OK.
Just about to start “Oranges”. Is there another book about Loukas and Ellie’s life together to come? Hi Anne, oder was gratefully received and the bag was posted yesterday! As for news about Loukas and Ellie, but did you get this months newsletter? Hi Sara, I have just sent a payment for a Tote Bag via PayPal, please let me know if my address was on the order.